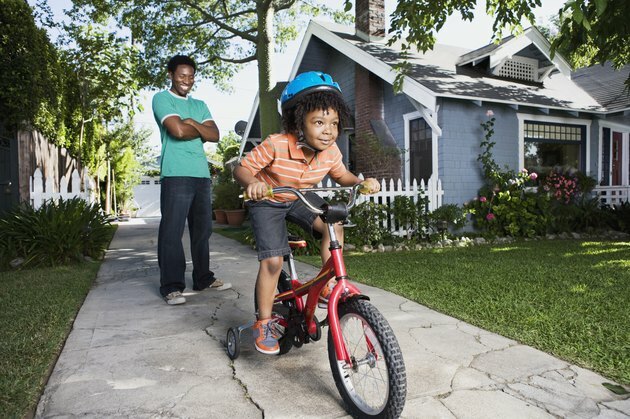 When buying a bike for your child, it's important to know whether he'll feel comfortable when riding it. 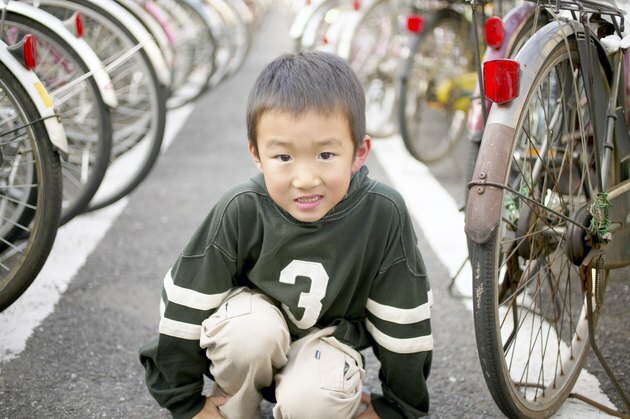 If a bike is too small, he'll feel cramped and perhaps even embarrassed when sitting on it. If it's too large, he might be afraid of losing control of the bike. 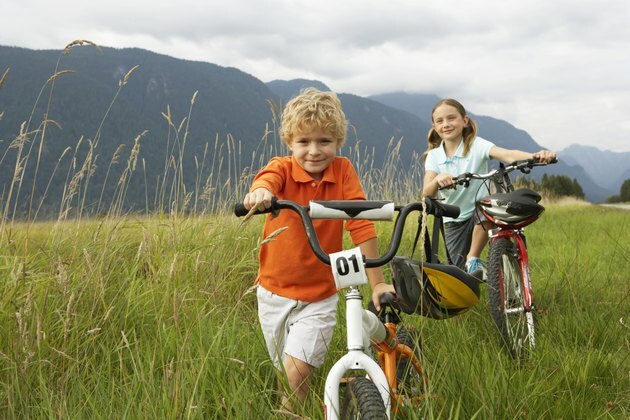 Using general guidelines for your child's age and leg length will help you to choose a bike that's a good fit. According to the International Bicycle Fund, most children begin riding a two-wheeler bike between the ages of 3 and 4, usually with the aid of training wheels. Between the ages of 4 and 8, they've grown sufficiently in physical coordination and agility to stop using training wheels. 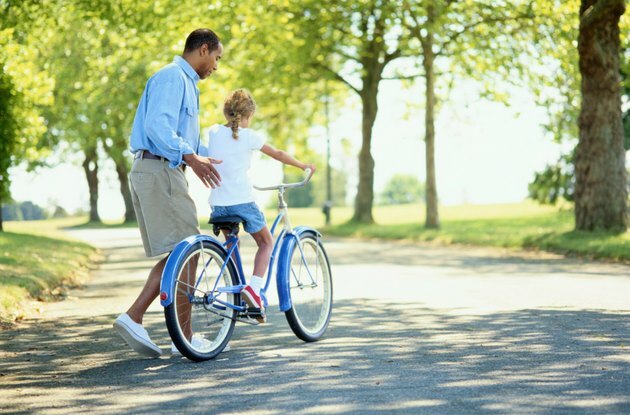 However, most children need a bike equipped with coaster brakes until they're about 5 years old, since using hand brakes requires strength and coordination. In addition, a child needs to be interested in learning to ride a bike, which might not happen until he's 10 years old. Unlike adult bikes, which are sized by frame and seat height, children's bikes are sized according to the diameter of their wheels. Children's bike sizes start with 12-inch diameter wheels and increase in 2-inch increments, ending with 24 inches. However, 14-inch and 18-inch diameter wheels aren't usually available. The most common wheel sizes are 12, 16, 20 and 24 inches. The Edinburgh Bicycle Cooperative offers general age guidelines for choosing children's bike sizes. In general, children between the ages of 3 and 5 can comfortably use bikes with 12-inch diameter wheels. Kids between 4 and 7 years old will need 16-inch wheels, 5- to 10-year-olds require 20-inch wheels and kids from 8 to 14 years old will need a bike with 24-inch diameter wheels. These general age categories overlap to allow for height and strength differences among individual children. 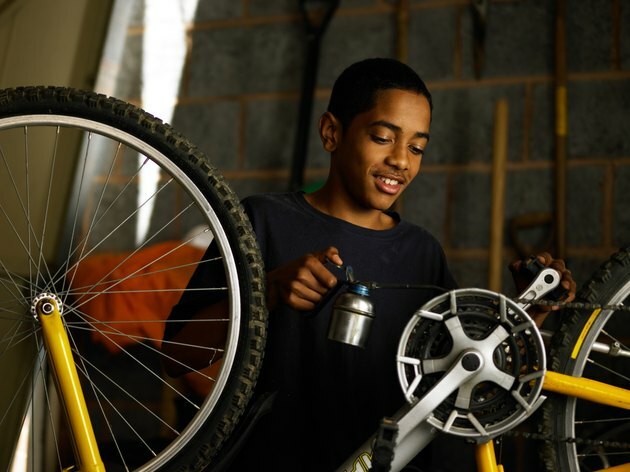 The International Bicycle Fund advises using your child's age and inseam measurement as a starting point for choosing a bike. The inseam is the length of the leg, measured on the inside from crotch to ankle. In general, children ages 2 to 4 with 14- to 17-inch inseams need 12-inch wheels, ages 4 to 6 with 16- to 20-inch inseams need 14-inch wheels, ages 5 to 8 with 18- to 22-inch inseams need 16-inch wheels, ages 6 to 9 with 20- to 24-inch inseams need 18-inch wheels, ages 7 to 10 with 22- to 25-inch inseams need 20-inch wheels, and kids 9 years and older with 24- to 28-inch inseams need 24-inch wheels. The ages and inseam measurements overlap to allow for individual height differences. Since the 14-inch and 18-inch wheel sizes aren't commonly sold, if you determine that your child needs one of those sizes, you'll probably have to experiment with other sizes. Take your child with you when you choose a bike. Consumer Search advises that you have your child sit on the bike's seat and hold the handlebars. In that position, the balls of her feet should be on the ground. For a boy's bike, have him straddle the top bar. He should have a 1-inch clearance. Since some bike models are styled differently, the wheel-size guide might not be accurate. If the bike you choose has a smaller frame due to its style, its top bar might be lower than other bikes. Be sure that the bike fits your child according to his leg length.